Take a ride uptown in style and plug it in! Reminiscent of the early Synchromatics of the 1940s, this archtop acoustic/electric has a spruce top, maple sides and back, maple neck, and rosewood fingerboard. The G100CE features a Gretsch pickup, separate volume and tone knobs, chromatic tailpiece, aged pearloid block inlays, vintage headstock logo, and compensated bridge. The 40's design is simple and elegant, and you'll be unlikely to find anything like it in the market at this price. Perfect for the Gretsch player looking for a no-nonsense, the G100CE guitar is a vibe-loaded acoustic that allows you to plug it in and won't break the bank! It's the couch guitar you can take to the streets. The Synchromatic's Gretsch pickup offers flexibility and tone. The chromatic bridge and tailpiece provide balanced string tension and enhanced bass response. The art deco design is vintage cool! 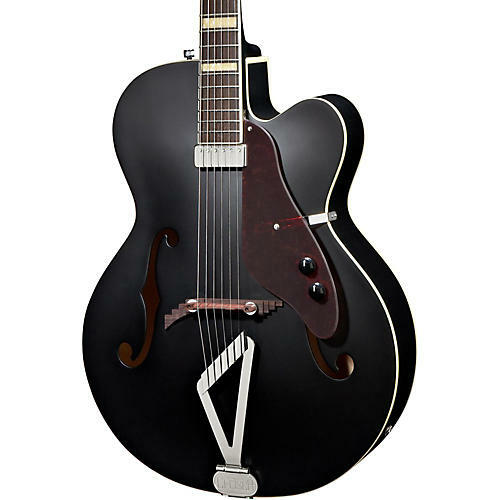 Unique Features: Vintage Wide-Block Pearloid Position Markers, Black Headstock Overlay, Pearloid "Gretsch" Logo, Bound Fingerboard, Multiple Body Bindings, "F" Sound-Holes, Streamlined Faux Tortoise Shell Pickguard, Knurled Strap Retainer Knobs, and Adjustable Truss Rod.